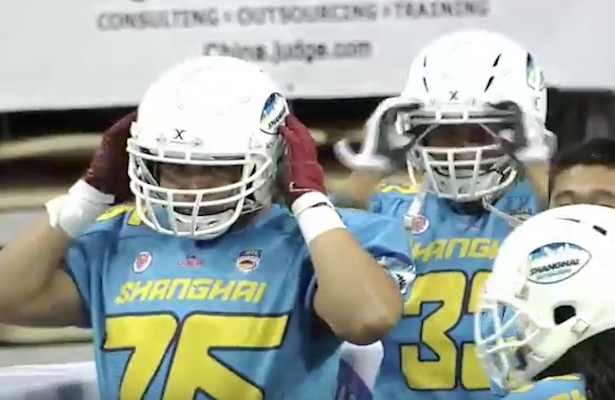 Usually you won’t hear a team say a match in week three is a “must win,” but that’s exactly what it was when the Shanghai Skywalkers faced the Shenzhen Naja. Both teams entered with 1-1 records and a victory was key to their chances at playing in the first ever CAFL China Bowl in early November. The teams combined for a CAFL record 109 points as Shanghai held on for a 61-48 victory. The 61 points set a single game team mark while Skywalker Quarterback Shane Austin lit up the Naja defense with a record performance completing 24 of a record of 41 attempts for 323 yards and single game mark of nine scores. Receivers Mike Washington and Shane Kauleinamuku were the benefactors as Washington hauled in a single game record five touchdowns and “SK” added four more. The Shanghai victory was still not secure until late into the fourth quarter. The teams traded a pair of touchdowns in the first quarter with Washington getting his first of the day while Naja quarterback Dak Britt found Tristian Purifoy for his second score of the season. The second quarter saw a total of seven trips to the end zone including the first ever kickoff return for a touchdown by LaChristopher Lee of Shenzhen who went 56 yards for the score. Washington ended the half with three tallies, Kauleinamuku two and Britt added a pair as the Skywalkers led 35-27 at the break. Ball control dominated the third quarter as Kauleinamuku’s third marker was offset by an Adrian Ferns three yard scamper as Shanghai led 42 to 33. In the final frame the Skywalkers were able to hold off the Naja who continued to grind things out on the ground. After “SK’s” fourth TD grab Britt found the end zone and added a two point conversion as the Naja trailed 49-41. The Skywalkers answered with Washington’s fourth scoring play but Britt connected with Xinhe Xu on a 26 yard scoring play to close to within seven points in the final minutes. Austin calmly took his team down the field, using the clock and time outs to advantage and on fourth and nine with Shenzhen needing a stop, Austin fired to Washington for the fifth time for the 61 to 48 final. Washington’s five scores were a single game mark in the new league. Shane Austin 24 of 41, 323 yards, 9TD, 0 Int. Britt: 8 of 17 for 84 yards, 2TD, 1 Int.